To claim this profile, please confirm you are Quinzia Fulmore. To follow this profile, please let us know your relationship to Quinzia Fulmore. RESULTLoss Girls varsity basketball vs. Hillside. The Dudley varsity basketball team lost Saturday's neutral playoff game against Hillside (Durham, NC) by a score of 49-45. RESULTWin Girls varsity basketball vs. Terry Sanford. The Dudley varsity basketball team won Thursday's neutral playoff game against Terry Sanford (Fayetteville, NC) by a score of 45-39. RESULTWin Girls varsity basketball vs. Northwood. The Dudley varsity basketball team won Tuesday's home playoff game against Northwood (Pittsboro, NC) by a score of 41-35. RESULTWin Girls varsity basketball vs. Mount Tabor. The Dudley varsity basketball team won Friday's neutral conference tournament game against Mount Tabor (Winston-Salem, NC) by a score of 44-38. Quinzia's basketball stats have been updated for the win vs. Parkland. The Dudley varsity basketball team won Tuesday's neutral conference tournament game against Parkland (Winston-Salem, NC) by a score of 60-34. Quinzia was selected the Player of the Game in the basketball game against Western Guilford on Fri, Feb 01 2019. Congratulations to Quinzia Fulmore for recording her 2nd double-double of the year! Quinzia was selected the Player of the Game in the basketball game against Faith Christian on Sat, Jan 19 2019. Congratulations to #33 Quinzia Fulmore for being selected the Dudley Girls Basketball Player of the Game. 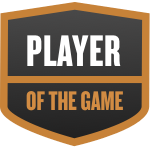 Quinzia was selected the Player of the Game in the basketball game against North Forsyth on Fri, Jan 11 2019. Quinzia was selected the Player of the Game in the basketball game against Western Guilford on Fri, Jan 04 2019. Quinzia was selected the Player of the Game in the basketball game against Page on Thu, Nov 29 2018. Congratulations to Quinzia Fulmore for her 1st career double-double! Quinzia's basketball stats have been updated for the win @ Ben L. Smith. RESULTWin Girls varsity basketball @ Ben L. Smith. The Dudley varsity basketball team won Friday's away conference game against rival school Ben L. Smith (Greensboro, NC) by a score of 62-20. Quinzia's basketball stats have been updated for the win vs. Mount Tabor. The Dudley varsity basketball team won Tuesday's home conference game against Mount Tabor (Winston-Salem, NC) by a score of 55-51. Quinzia's basketball stats have been updated for the win @ North Forsyth. RESULTWin Girls varsity basketball @ North Forsyth. The Dudley varsity basketball team won Friday's away conference game against North Forsyth (Winston-Salem, NC) by a score of 58-21. The Dudley varsity basketball team won Tuesday's home conference game against Parkland (Winston-Salem, NC) by a score of 70-31.